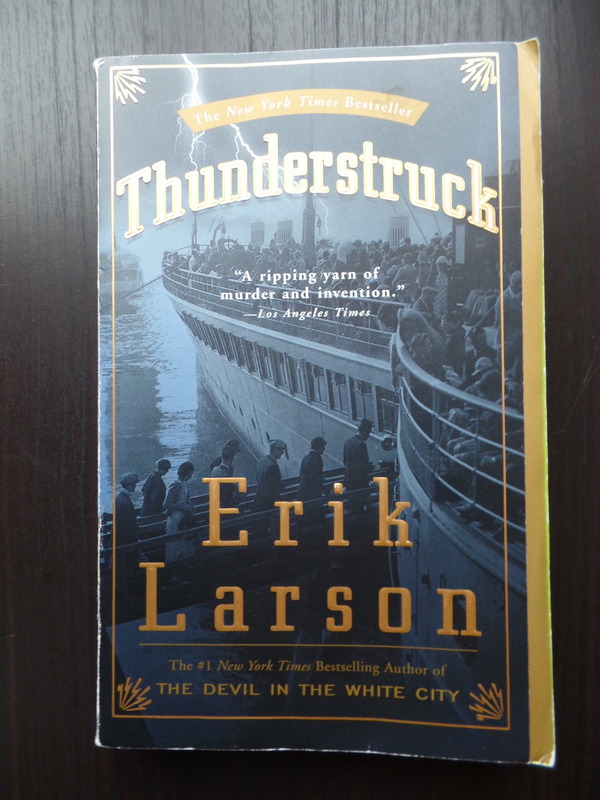 Not Awestruck Until the End of Thunderstruck – The Bookshelf of Emily J.
Thunderstruck (2006) by Erik Larson started slowly. It took me a few months to read it, because I kept losing interesting during the first half of the book. It is about the collision of two events in the early 1900s. One is the invention of the wireless, which Marconi invented and perfected. His ability to transmit messages across the ocean caused a sensation. This seemingly magical communication method helped to catch a fugitive killer. This is the second event, in which Dr. Harvey Crippin’s wife Belle goes missing. Crippin, a mild-mannered and kind man, tells people that his wife has finally left him, as their marriage was an unhappy one. He even reports on her travels in America, noting that she has gotten sick and died. But as neighbors worry and detectives begin investigating, they find a mass of flesh and tissue that appears to be Belle’s body in the basement of the doctor’s home. Meanwhile, Crippin, and his lover Ethel, have fled London. They are disguised as a father and a teenage son on a boat crossing the Atlantic. Wireless communication makes it possible for Chief Inspector Dew to receive a message from the ship’s captain, saying that he believes to have the fugitives on board. Dew takes a chance and catches a boat that will beat Crippin and Ethel to Canada. There he meets them and arrests them both. Once this part of the story takes off, the book reads like a bestselling thriller. However, it is a true story. That’s what I love about Larson’s books: that they are based on historical facts and he pieces these amazing tales together with archival research. At the end of Thunderstruck, Larson explains his research adventures in old libraries and archives in Europe. The act of writing such a book sounds just as exciting as the story itself. I found this book because of you, my blog readers! I read The Devil in the White City, another of Larson’s book and what I think might be his best, a while ago. When I posted about that one, several of you mentioned that Thunderstruck was also a great one to read. For me, it was slow to start and hard to get into, but once I did, I spent an entire afternoon on my couch just devouring the rest of the story. I ignored other responsibilities to finish this gripping tale of murder, deception, and invention. Larson has a new book out. You are right, he is a gifted storyteller who doesn’t let his enormous research clot the narrative. Well said. That describes his books exactly! I hope you enjoy it if you end up giving it a try. I am reading my first book by Larson right now, his newest one – Dead Wake. I had been hearing about him so much, and that his books are good for people who prefer fiction, like me. It was a bit slow to get going (although, it sounds like Thunderstruck may be slower), but then I couldn’t put it down. He really knows how to draw out the suspense! Your comment makes me think that perhaps he does the slow start on purpose. It really does build momentum as you get going and the background on the historical figures is essential so that their stories become more compelling. That’s what I was thinking, too. You need the slower set up to really be invested in what eventually happens. I love Erik Larson. The Devil in the White City was fantastic but I actually think In the Garden of Beasts is his best work. I’m very much looking forward to reading Dead Wake and Thunderstruck is totally on my list. I’m glad that it ended up being a good one. Well it looks like I’ll have to add another Larson to my list! Every time I post about him, I learn more and want to read more. In the Garden of Beasts, here I come! I agree, In the Garden of Beasts was amazing. Can’t wait for Dead Wake! I need to read both of these! I’ve been meaning to read Larson but just haven’t gotten around to it . . . yet. Keep Larson on your TBR list! He shouldn’t be missed. Oh, it kinda sounds like his other novel, Devil in the White City, where he combines the Chicago Worlds Fair with a serial killer that was at large at the same time. It would have been really interesting except that other than the killer being in Chicago at the time of the World’s Fair, the one did not have anything to do with the other. It was a fairly interesting read, but I think it could have been better. It is remarkably similar to The Devil in the White City. I see what you mean by the two stories seeming disparate, but I think the charm of Larson’s books (from what I’ve read so far) is his ability to take two historical events and put them in conversation with each other in unexpected ways. I agree that The Devil in White City is his best so far. I haven’t read his book yet about the sinking of the Lusitania! That sounds like a good one. I think I just need to read all of his books! Too little time, too many books!